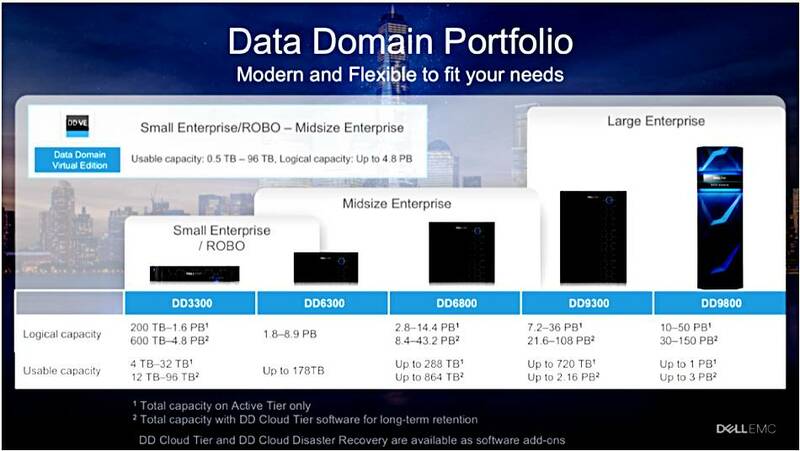 Down in the Dell there is a new Data Domain box – a smallish, entry-level one – the DD3300. It is a 2U rackmount chassis with 3TB or 4TB SAS disk drives providing up to 32TB of usable capacity, said to be 1.6PB after deduplication (logical capacity) and data can be ingested at 7TB/hour using Data Domain Boost. If a backend cloud tier is used, the usable capacity goes up to 96TB and the logical capacity shoots up to 4.8PB. Small print hard to read? Embiggen the thing by clicking on it. The DD3300 is for small and medium enterprises and remote/branch office locations in bigger businesses. The Cloud Tier backend can be Dell EMC Elastic Cloud Storage (ECS), Virtustream Storage Cloud, AWS, Azure, IBM Cloud Object Storage and Ceph Object Storage. The system supports Data Domain Cloud Disaster Recovery and Data Domain Replicator. Dell says its average data reduction rate is 10-55x.